Filmmaker Wim Wenders is one of Germany's leading directors, and is often regarded as the leader of the New German Cinema, which flourished in the seventies and early eighties. A winner of the Palme d'Or, Wenders continues to takes risks, moving between feature films with A-list actors and low-budget documentaries. His credits include Paris, Texas; Wings of Desire, Far Away; So Close; The End of Violence, and Buena Vista Social Club. Wenders is great lover of American music and culture, and his films have been influenced by American road pictures. Wenders latest picture is The Million Dollar Hotel. The film is about a billionaire's son who dies in a skid row hotel. A federal agent played by Mel Gibson turns the lives of the hotel residents upside down trying to find out if the deat was murder or suicide. Shot for a mere $8 million, the film has its world premiere at the Berlin Film Festival in February 2000. I interviewed Wenders one early morning following the final mix on The Million Dollar Hotel. Congratulations on winning the best documentary award from the National Board of Review. 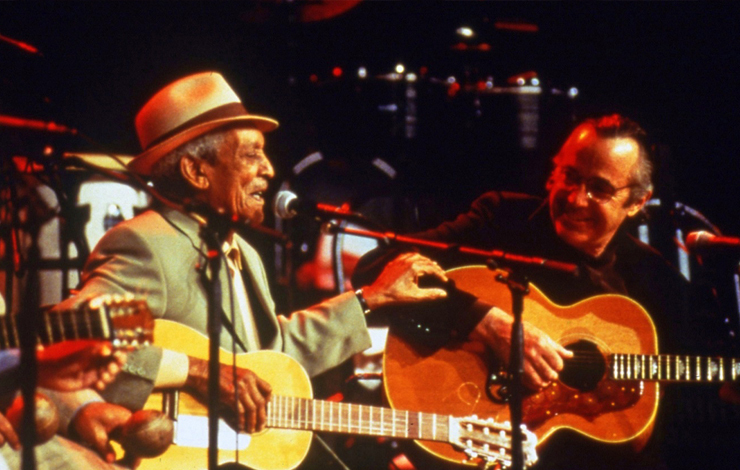 Did you shoot Buena Vista Social Club on digital beta tape? We shot a lot of it on Digi Beta. And one-third on the Mini DVs. You had two great DPs on this—Joerg Widner (American Werewolf in Paris) and Robby Mueller (Breaking the Waves). I was curious about the shot of the man sitting alone on a bench in the park in front of an enormous tree. You encircled him so effortlessly. Did you use a dolly? No, that was Joerg's shot with a Digi Beta and a Steadicam. Any time I used the Digi Beta. I used the Steadican. Which Mini DV camera did you use? I used the tiny little one, the smallest one Sony makes and the three-chip one. And I shot with these two myself. Did you have a difficult time in post without time code? Yes! I had to transfer everything I shot in Mini DV in post to Digi Beta to get time code. And that was a bummer. If I had to do it again, I'd be much smarter. I'd use a DV cam next time. But I didn't have one at that time. We rented a Digi Beta deck for a weekend and transferred all our Mini DV material to Digi Beta on our own, 24 hours a day. And that was another nightmare, because then we found out if you do that, there is no other digital transfer that you can do. I don't know if you know that, but with Mini DV material, you have one digital pass and then there is a blockage in it. And you cannot make another digital pass. We found out the hard way. So you cannot master from your DVs? It's very difficult. Extremely difficult. You can only make one digital copy. I don't know why they do it, but that's the way it is. I understand there are audio drawbacks on the Mini DVs. Did you experience any sound dropouts? We never had these long shots, even on the Digi Beta over long interviews, like in the park, as you mentioned before. On the camera sound track we'd be out a frame or two. Did you record your sound separately on a DAT? Yes, we did, and that's why we didn't have a problem with sound. On the Avid we first used the camera track, and we ran into problems continuously, but we had everything also recorded on a DAT. And the music was all on DAI anyway, all on 24 tracks, before we even shot the studio or the concert. But there are some flaws with DV technology. There are still limitations to the medium, but you are a hero to people who just want to get out there and make movies. Yes, exactly. Even with this film, I'd just learned DV. I know so much more now about how to approach it. I think we've just seen the tip of the iceberg of what people can do in the near future—what young people can do if they're smart and if they have a touch and a feeling. They can do amazing things. They can find an audience all over the world. lt's really exciting. Did you expect a theatrical release for your documentary? No, we didn't know that when we were shooting. It only dawned on us in the middle of editing. We realized it was not 'Just," a music video, but that somehow, in its own way, it's a character piece. That's when I thought, "Hey, hold it, wait a minute." Because music documentaries are such a no-no, per se, for a theatrical release. For the last 20 years, there was Woodstock and afterwards there was nothing. And even Woodstock did not do so well theatrically at first. It was almost forbidden to even think about theatrical release in the genre of music documentaries. Only when I realized it was much more than a music documentary. These people were real characters. It was much more character-driven than I ever thought it would be. So you created a three-act structure? Not really. We had to come up with a structure in the editing room from scratch. Because initially I had gone to Havana—I really thought that was that. We're only gonna shoot three to four weeks in Havana and go home and edit it. Because nobody knew about this non-existing band. They're really an invention of Ry Cooder's in the studio. Nobody knew that they would be giving a concert in Amsterdam. These concerts were then the second chapter of the film; that set up the question of how to set up Cuba and Amsterdam. Only after Amsterdam did the possibility of the New York concert at Carnegie Hall emerge. Of course, I was not going to go to New York. All of a sudden we had three chapters. Then I said, "Hold it! Stop! We have to edit this." How many hours did you ultimately shoot? We had about 100 hours. That's the problem with shooting on inexpensive tape! You end up with so much to edit. Right, you continue to shoot and shoot. We had 20 hours we didn't even consider. We have a week of rehearsal in Amsterdam which we didn't know how to fit in. Did you do a paper edit, and transfer it all, the VHS with a time code, and then make your selects? No, no. We went with everything we shot on Digi Beta right into the Avid. For a while we went with all the Mini DVs right into the Avid and realized it was all baloney and transferred the Mini DVs to Digi Beta and then fed that right into the Avid. It sounds like you were working on a tight budget. Oh yes. We didn't have a budget to begin with. I had a week to prepare myself and get a budget and a crew together. When Ry called me and said, "Hey, I'm going to Havana. Remember you said you wanted to come with us?" He gave me one week's notice. I had a two-man crew in Cuba and then Joerg found two men there, one to pull camera focus and one to set up lights, though most of it we did without lights anyway. Cuba did require permits. We thought we would have a lot of hassles because you cannot shoot in Cuba without permits and without the cooperation of ICAIC, the government film institute. They were extremely accommodating. They didn't refuse us a single permit. We shot whatever we wanted, uncontrolled. They didn't have anybody following us. They gave us truly carte blanche over the entire city. You were quoted as saying about Buena Vista Social Club, "I don't think that approach or technique defines a film. What counts is the attitude of the people behind the camera towards those in front. I hope it shows because we loved them." That's beautiful. It reminds me of what Lawrence Kasdan said, "Making a film is not about the lens or the camera, but about what kind of a person the director is." You started out as an actor? Oh, no. That's misinformation. I did, in film school, for a few friends, appear in a couple of colleagues' films, but I never thought of myself as an actor. Even that, no. I never wanted to become a film director. I always thought I'd become a painter. Yes, but not that much. I still do though. You're doing a movie now? Yes, The Million Dollar Hotel. We finished last night, the last day of mixing. We have our answer print and I've seen our first combined print. I'm pretty wasted at the moment. This one was a different animal. It's not a documentary. It's a fiction film, and as we shot it in Los Angeles and as our leading actor was Mel Gibson, you can imagine it was different circumstances. Mel Gibson has a reputation for being pretty feisty on the set. He was amazing. He worked more than he ever worked in a movie because we only had three weeks with him. He worked from the moment he arrived until 12 hours later. We really worked him and he was really fabulous. I'd always loved him as an actor. From the first time in Mad Max and in The Year of Living Dangerously. Those were films I truly adored at the time. I thought he was a great actor. And he accepted our film because he liked the challenge of it. We didn't need the superstar name, we needed an actor, and he loved it. No, a friend of mine with whom I did The End of Violence wrote it. It was actually written by three people, by Bono of U2, Nicholas Klein and myself. Bono conceived and wrote the story. Nicholas, Bono and myself wrote the script. We worked on it for five years. So, now we have a print of The Million Dollar Hotel, and now I go to Australia.